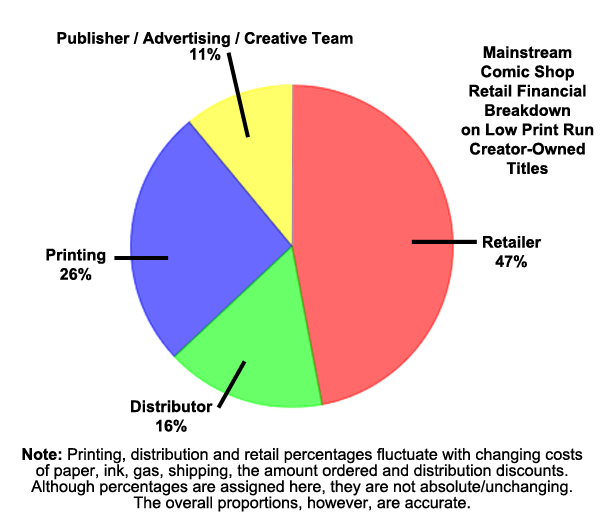 Jim Zub (writer/creator Skullkickers) has taken the time to write about the financial realities of income derived from creator owned printed comics. The article on his blog discusses mainstream comic distribution through comic shops with low print run books. Here's a link to his article on digital publishing. One thing to keep in mind about digital distributors is that they do not give you a digital file to keep. You’re paying for rental of the comic. 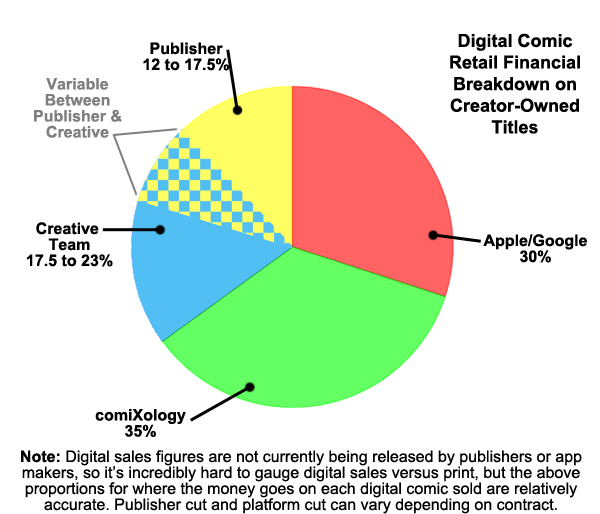 For instance, Graphicly stopped distributing comics and instead focused on digital publishing tools for comics. I don't have my Graphicly comics anymore. Thankfully I had just started getting comics from them before the change, so I wasn't in too deep. What's happening with the Big Two? (DC Comics and Marvel for those not in the know.) The upper limit on sales of a superhero comic book these days is about 230,000; just two to five series routinely break into six digits. Issues of Spider-Man and X-Men sold millions years ago. Marvel and DC raid alternative comics and web comics to find new talent. The talent may go because they can get paid. Do they create anything new? Maybe. Younger generations have learned the lessons of Siegel, Shuster, Kirby, Alan Moore and so many others. They usually decline to invent anything new for the majors and prefer to control their own creations. Those talents eventually leave. They self-publish (in print and on the web) and reap whatever financial benefits come their way. Are Afraid of The Dark?